Wikipedia had nice write up on which country consume sea urchin. "Humans consume sea urchin ("roe") either raw or briefly cooked. Sea urchin "roe" is not actually roe, but rather the organs that produce the roe (the gonads). Five strips of roe reside within the structure of the urchin, a yellowish or orange substance resembling a rather firm custard. Sea urchin roe is a popular food in Korean cuisine, and it is called "uni" in Japanese sushi cuisine. It is a traditional food in Chile, where it is known as an "erizo". Sea urchins are highly appreciated in Spain, Greece where they are known as "achinos"-(αχινός), and also in Italy where they are known as "ricci di mare". 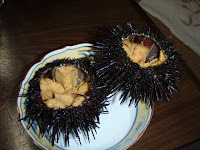 Apart from domestic consumption, Chile and a number of other countries export the sea urchin to Japan in order to meet its demand throughout the country. Traditionally considered an aphrodisiac, sea urchin "roe" has been found to contain the cannabinoid anandamide"
I only knew Japan, France, Monaco and Italy consume sea urchin where I tasted it previously. I would love to taste it in Spain and Greece! When you buy sea urchins in Japan or at a Japanese market in the US, they usually sale them cleaned and lined in wooden boxes (see left). 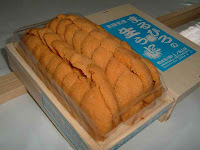 Some Japanese companies started to sell it in a container with sea water to preserve the delicate texture and moisture. You can buy whole uncleaned sea urchin only in sea side market in Japan. Majority of sea urchin in California come from Santa Barbara. They tend to taste sweeter and bigger than Japanese ones. I like eating Santa Barbara ones when I'm in the US because they are fresher.....Freshness is very important. Live sea urchin has movable spines. When it start to die, some spins come off. Picture on the left is a sea urchin I coughed in Nha Tran Vietnam. I was very surprised to find whole (uncleaned) sea urchin at a fish market at San Francisco Ferry Building. It was $10 each. It was very big (about 5 inches wide not including spines) but only had 6 roes. I was VERY disappointed because it did not taste fresh... 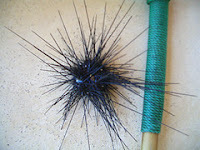 I think it is safer to buy boxed (cleaned) sea urchin if you are not at sea side market near the sea urchin harvesting spot. 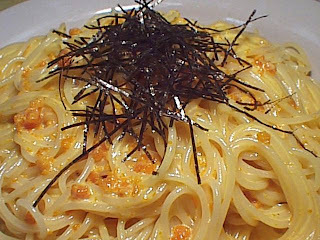 Even though I like to eat sea urchin raw and simple usually, I love sea urchin spaghetti! It is very popular in Japan. The way Japanes prepar this dish is very simple. Ingredients consist sea urchin, sea salt, spaghetti, cream and for the garnish, Nori (Dry seaweed) and Ooba (Japanese mint leaf). Some people add squid, Salmon eggs or cod eggs. I like it very simple so that you can taste mild sweet flavor of sea urchin. I also tasted this dish in Capri Italy. The one I tasted was very simple, almost like the Japanese one. After searching on the web, I have realized Sicilians eat sea urchin spaghetti as well. I love Sea Urchin! I usually like to eat very simple traditional Japanese way - Sea Urchin Sashimi (see left -from Ryoko's in San Francisco), Sushi, had roll, on top of rice bowl. I love shochu! It is not a well know liquor but it is one of my favorite. Those who don't know shochu is distilled clear liquor made of wheat, rice, sweet potato or buckwheat. It is usually 25% alcohol level. Some people mix it with fruit juice, soda, lemon, or salted plum. I always drink it on the rocks. Very clean tasting which goes very well with almost any food. It has been the most popular drink of choice in Japan for the past 20 years or so. Here's an article in the San Francisco Chronicle about shochu. There are more than 450 shochu distiller and more than 5000 labels of shochu! I think Korean Soju is more common in the us. Most common label is Jinro. Soju is made almost the same way as Shochu but to me they taste very different. I thinks Shochu is more clean and delicate. Many restaurants in Japan offer Shochu by bottles. When you order a bottle of Shochu, you'll also get all the accondiments such as ice bucket, lemon, water, tea etc. When you cannot finish the bottle at once, you can put your name on it and the restaurant will keep it for you untill your next visit.